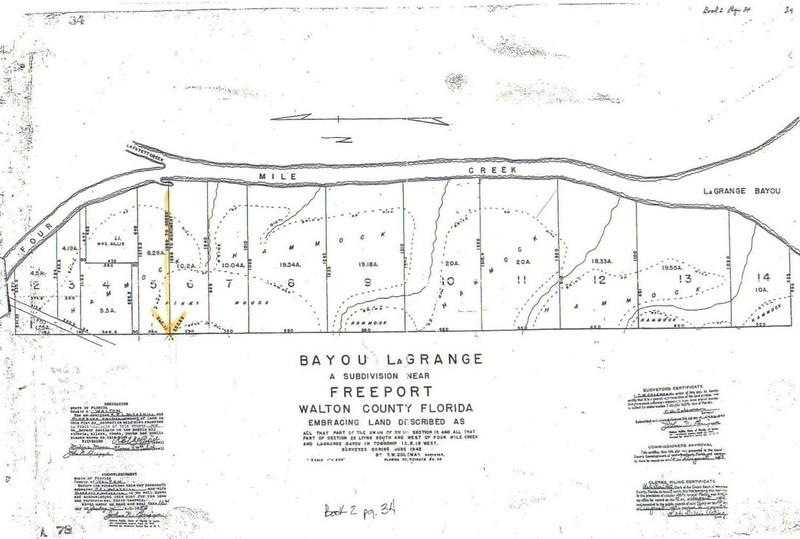 Plan of Town of Freeport in Walton County, Fla. 1901 This is a certified copy that was obtained from the public records at the Walton County courthouse. The document is currently not recorded in any of the official records, however the document is located in the courthouse and regarded as an (unofficial) official document that you many purchase certified copies of. This Survey is referenced in hundreds of Deeds today, and heavily relied on by the City of Freeport and Walton County. It is used by Walton County to produce the County Tax Map of Section 15. There is a page with more detailed information at "Duputy Stephens"
S.K. Miller is identified on this document as the County Surveyor for Walton County and the creator of this survey in 1926, however this document was made for a private land owner. Miller notes that he placed all of the reference monuments used in his survey including the point of beginning (POB). He does not indicate that there are any existing forms of monumentation at the point of beginning (POB.) Miller does not indicate how or if he tied Into the TRS Grid before setting his POB. There is no reference to finding any type of pre existing Federal TRS monumentation near the section corner location he ultimately set to start from. Miller begins his description of the land mass surveyed in this way: “Beginning at the SE corner of the SE ¼ of section 10, Township 1 south Range 19 west, run west approximately 34 chains 3 ¼ degrees South to Old Eucheanna and Freeport roads, etc…..” However, the Federal TRS survey identifies an East 6 degree 10 minute bearing on the township grid. The bearing runs from west to east at a south 6 degree, 10 minute east bearing, verified by Buddy Bannerman - a surveyor whose services are heavily relied upon by the Florida DOT and other agencies. Therefore, S.K. Miller runs his line the wrong direction when compared to the Federal TRS field notes. It is unclear if the line run by Miller was influenced by the survey work done in 1901 by “Duputy” Stephens. It is very probable that this is the case. There is also the question of authority. A County Surveyor must follow the Federal survey and not change it in any way. There is no accuracy or compliance in placing a corner monument where a surveyor thinks it should be, or where it is convenient without finding pre existing Federal monumentation or evidence of witness trees and noting such evidence on the survey that is being created. A section corner must be proven in accordance with the instructions from the Office of the US Surveyor General. There are no longer public records available in Walton County from the decades involved with the existence of the County Surveyors office. There are no field notes, surveys (other than a handful in the public records to prove the existence of the office), or files to review and compare against the Federal TRS field notes and files. The survey and the section corner that S.K. Miller established and noted in the public plat book is all that we have today. S. K. Miller identified as the County Surveyor for Walton County and the reference to "PRM" (placed reference monument) of the Section corner. Surveyors are required by law to find BLM section corners, not place them. The correct bearing from the original BLM TRS survey of 6 degrees 10 minutes East. "Beginning at the Southeast Corner of the Southeast Quarter of the Southeast Quarter of Section 10.....Run west approximately 34 chains 3 1/4 degrees south..... " This line was shot from east to west at 3 1/4 deg instead of (south) 6 deg. 10 min (east) measuring from west to east. Government Lot 4 Section 22 was originally surveyed by the GLO at 96 acres. The Coleman survey identifies the same land of Government Lot 4 as having a total land mass of 146.64 acres. There is a 50.64 acre difference between the 2 surveys on the same land mass. The subdivided lots in the Coleman survey for Government Lot 4 are shown as follows: Lot 6 10.2 acres, Lot 7 10.04 acres, Lot 8 19.34 acres, Lot 9 19.18 acres, Lot 10 20 acres, Lot 11 20 acres, Lot 12 18.33 acres, Lot 13 19.55 acres, and Lot 14 10 acres for a total of 146.64 acres compared to the TRS/GLO survey of 96 acres. By reviewing the 2 surveys, the conclusion is that Coleman’s section corners are located too far west and too far north and with the land mass mislocated when compared to the Federal TRS survey corner locations and sizes. The Coleman survey was approved by Walton County when there was still a State and Federal requirement for a County Surveyor to maintain the TRS grids. The image below identifies the origanal land mass as 96 acres. This survey has been approved by the Walton County Commissioners and the County Engineer. The section line location and the corner that is noted as NW corner of the NE ¼ of section 32 East of Bear Creek are shown as the north line across the top of the survey. This corner and the line are tied to the concrete monument identified by the DOT as “Section line as per Plat”. The location of this section line and the section line mentioned in the survey of Cross Creek Shores shown below the La Grange survey should be the same line location for two adjoining sections. However, this is not the case as outlined on the DOT survey which shows two distinct and separate lines with a close to 200 foot hiatus between the two. Both lines represent a continuation from the NW corner of Section 32 across Bear Creek to the east side of the creek and beyond. The GLO never surveyed land for Section 32 on the east side of the creek. The mistake of the line mislocation began with a tax deed sold by Walton County for land that should have been identified as located in Section 29. 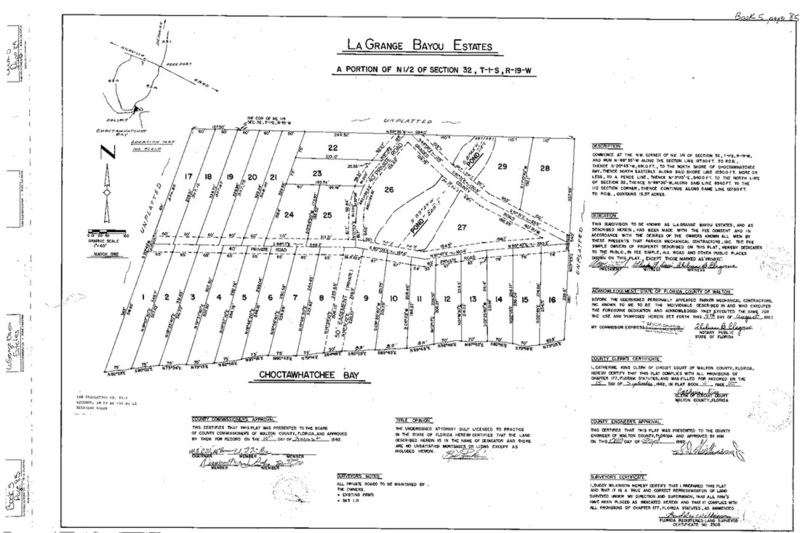 The diagonal line in the lower left corner of the image below and the corner that is noted are “tied to” the concrete monument identified by the DOT as “Section line as per Survey” The location of this section line and the section line mentioned in the above shown survey of La Grange Bayou Estates should be the same line location for two adjoining sections. However, this is not the case as outlined on the DOT survey which shows two distinct and separate lines with a close to 200 foot hiatus between the two. Both lines represent a continuation from the NW corner of Section 32 across Bear Creek on the east side of the creek. 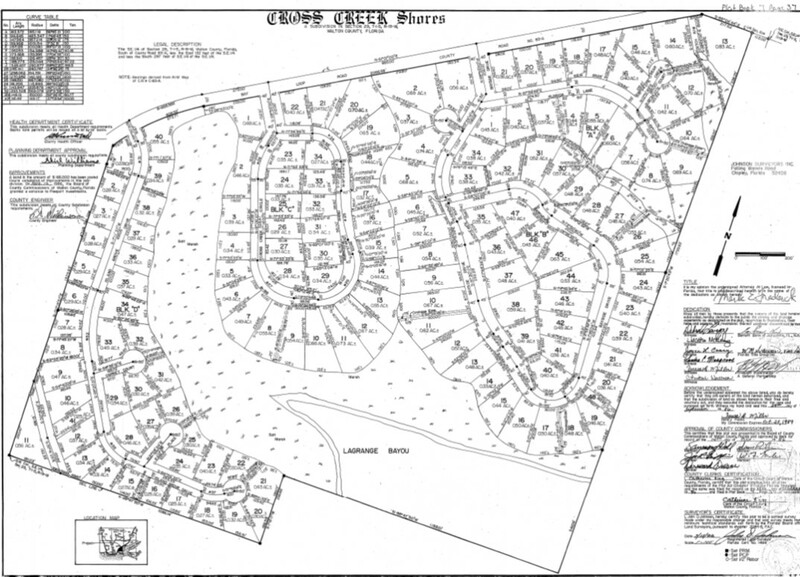 The GLO never surveyed land for Section 32 on the east side of the creek. The mistake of line mislocation began with a tax deed sold by Walton County for land that should have been identified as located in Section 29.